Your trip through the Mojave desert begins with a 30-minute, air-conditioned ride from Las Vegas to Jean. After a brief, thorough safety briefing, set out on a thrilling off-road adventure through the Hidden Valley National Monument and McCullough Mountain Range. Enjoy the rugged desert landscape as you maneuver through trails, ride up to mountain overlooks and zoom around legendary off-road racetracks. These off-road RZR vehicles are equipped with a cage structure that surrounds the passengers on all sides, adding an extra level of security. 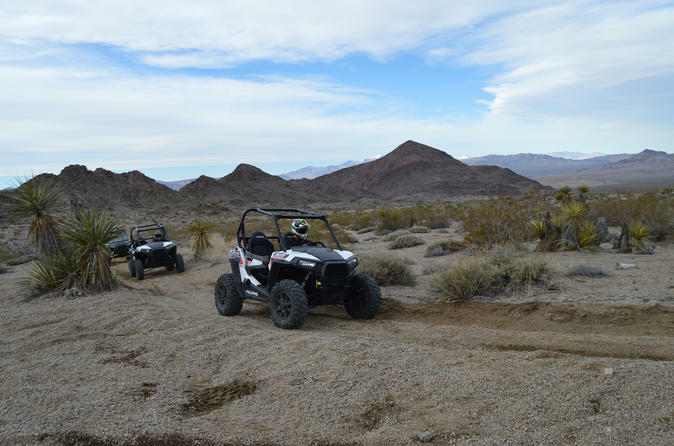 This is the longest RZR tour available in Las Vegas and will cover anywhere from 20 to 50 miles (32 to 80.5 km) of rugged desert terrain, depending on group size and riding level. If you book the morning tour, stop for a short break at Buffalo Bill's Hotel and Casino in Primm, Nevada, on the California-Nevada state line, and then prepare for your return RZR ride. Afternoon tours offer the same ride but are shorter in total duration, as they do not stop in Primm. You will ride in a 2-seat Polaris RZR 900 which is less than a year old. Either drive your own RZR for the ultimate desert experience or choose to join up with a professional driver so you can sit back, enjoy the ride, and take in the awesome desert scenery. This is a great option for children who are too young to drive on their own. Your tour ends with complimentary air-conditioned transportation back to your pickup location. Special Offer - Book a 2-seater and save 23% compared to the local operators price! - Book Now!